Review Summary: AAP KAA SURROOR has tremendous curiosity-value attached to it. And that in turn will ensure a fantastic opening for the film. AAP KAA SURROOR has tremendous curiosity-value attached to it. And that in turn will ensure a fantastic opening for the film. 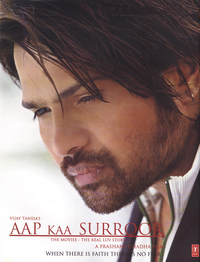 Himesh Reshammiya is all set to become the Jack of all trades. The movie is just gloss and emerges impractical at times. There is nothing special that marks its uniqueness as a real love story. The only thing worth remembering in the film was Himesh's sidekick mentioning commenting: 'Agar naak cut gayee, toh gana kaise gayega?' Well, Himesh still has his khatarnak for that.